How long am I banned from editing? Recently I have been doing a lot of edits that remove the design tag, as it is being burninated. See: The [design] tag is being burninated. So recently I have suggested quite a few edits, by only removing the design tag. A lot of them were rejected and now I understand that I need to edit the question as well as removing the design tag, by reading this: How do tag removal (burnination) requests work? When I suggested those edits I thought I could only just remove the tag, but after doing research I was wrong. So now I want to know how long will I be banned for? According to this answer, if the ban was caused by having too many suggested edits rejected, the length is fixed at 7 days. If unfortunately a moderator spotted your behaviour and manually issued this ban, then no one knows how long it is - you have to consult the moderator team so they can have a look. But common sense prevails, so if this is your first offense, it's unlikely a moderator will ban you for long. As a bottom line, try to learn how Stack Overflow works before putting into practice. Batch suggesting edits to remove a tag that's pending burnination is not that helpful. Try to focus on more severe issues like wrongly formatted code, blatant mistakes, etc. when suggesting edits. Not the answer you're looking for? 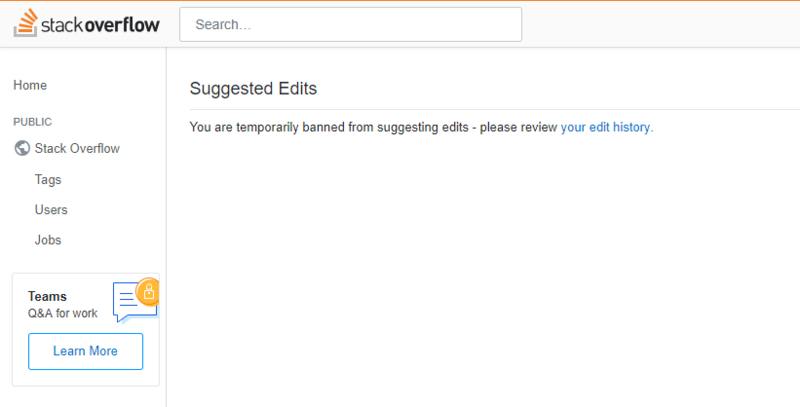 Browse other questions tagged support edits suggested-edits edit-ban . Do the editing penalty durations increase?